About 96% of the world’s acetone production is as a by-product of phenol production. Therefore, a lot of the trends in the phenol industry also apply to acetone. The global acetone industry is driven by the solvents sector, which represents 34% of global demand. Global solvent demand from acetone will continue to maintain a healthy growth rate through 2022. Methyl methacrylate (MMA) is the second-largest end use for acetone. In 2017, global demand for MMA resin accounted for 25% of total acetone consumption. Bisphenol A is the third-largest demand sector; however, by the end of the forecast period, bisphenol A demand will exceed that of MMA. Acetone (dimethyl ketone, 2-propanone, CH3COCH3) is a clear, colorless, volatile liquid with a sweet odor. It is both the simplest aliphatic ketone and the most commercially important. Nearly all world production of acetone is via cumene peroxidation, as a coproduct with phenol. Its main chemical use is as an intermediate in the manufacture of acetone cyanohydrin for methyl methacrylate (MMA), bisphenol A (BPA), and aldehyde and alcohol (aldol) chemicals. Direct solvent applications account for a large portion of world demand. 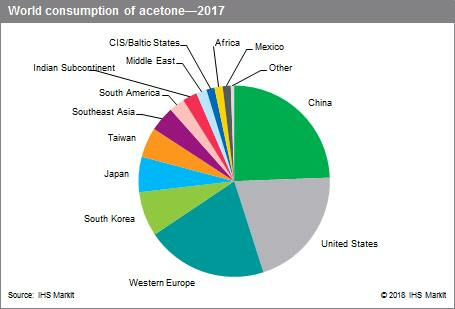 For several reasons, acetone supply tends to be in excess globally. For roughly every two units of phenol produced, one unit of acetone is produced. While bisphenol A has been one of the better-performing derivatives, it consumes a higher phenol ratio at three parts to phenol to one part acetone. In turn, strong bisphenol A demand will lead to a longer acetone market. Secondly, MMA is another important acetone derivative and MMA technologies have been shifting. As capacity is built to meet increasing demand, some of the new capacity is based on nonacetone routes, such as units that can consume ethylene and methanol. Both of these feedstocks can be produced at very low cost, if natural gas is available at the low prices seen previously in the Middle East and now in the United States. In 2017, worldwide demand for acetone was led by China, the United States, and Western Europe. Solvents are the largest end use, and are used in products such as nail polish removers, cement, lacquers and finishes, cleaners, paint, coatings, films, and adhesives. Pharmaceuticals are also an important consumer of acetone solvent, with large quantities being used in glass-reinforced plastics, rubber chemicals, and household, cosmetic, and personal care products. The solvents sector is usually the last place acetone ends up, and then only if it cannot be sold into the other higher-value applications. Solvents are expected to be one of the faster growing markets over the next five years. MMA is currently the second-largest market for acetone. The largest end use for MMA is PMMA (polymethyl methacrylate). PMMA resins are used to produce acrylic sheet (cast and extruded) and acrylic molding and extrusion compounds. Commercial, residential, and nonresidential construction and remodeling are the largest markets for acrylic sheet. Other markets include vehicles, aircraft, and marine equipment. Automotive parts and medical devices are the largest applications for MMA in molding and extrusion compounds. MMA is expected to see the slowest growth over the next five years. Bisphenol A was the third-largest end use for acetone in 2017. Bisphenol A is a raw material for the production of epoxy and polycarbonate resins. Polycarbonate has driven most of the growth for applications in optical media (CDs and DVDs), and the electrical and electronic (insulators, connectors, and housings) and automotive sectors. However, as new technology has been developed, and movies and music are increasingly streamed from the internet, the optical media market has stopped growing. The construction, automotive, and computer segments are now seen as key growth markets by polycarbonate manufacturers. Polycarbonate demand is expected to increase through the forecast period, which will continue to help drive BPA growth. All end uses are forecast to see positive growth over the forecast period, and global acetone demand will continue to improve as a whole.